Selling a house can be a nerve-wracking experience. Not only do you have to deal with the daily stress of having prospective buyers in your home, but you also have to handle the potential feelings of rejection when no offers for your house are forthcoming. Sellers may only see the lifetime of happy memories they built in their home, but buyers are usually focused on the (potentially expensive) negatives that come with the house. Here are some of the biggest issues buyers may hate about your home. Fixing these things can help prospective buyers see themselves living in your house instead of moving on to the next one. Some interior design is clearly the product of its time. Harvest gold and avocado appliances indicate that your last kitchen update occurred during the Nixon administration. Mauve and teal walls, tiles, or carpets will make buyers think you are still addicted to Miami Vice. And faux-finished paint jobs, such as sponge-painting, rag-rolling, and stippling, are about as current as Beanie Babies and the Macarena. There are two reasons why it's a mistake to leave up any outdated decorating when trying to sell your home. The first is that your buyers will see these style choices as something they need to undo. 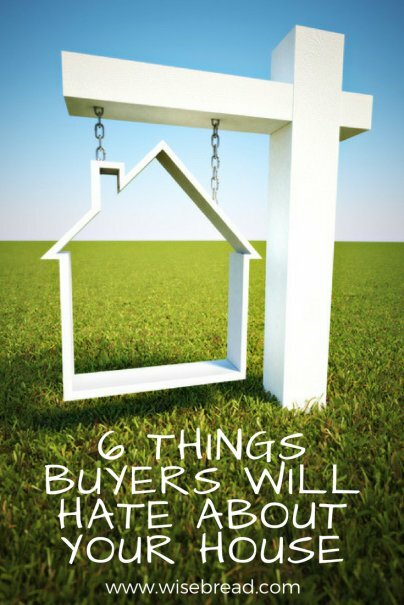 It will cost them money and time for updates, which will decrease their willingness to pay full price for your house. Wall-to-wall carpeting used to be a touted feature of a home, but it has now become a definite negative for the majority of homebuyers. Even first-time homebuyers expect hardwood floors, and will be turned off if they find wall-to-wall carpeting. There are a number of reasons why carpet has lost its hold as a positive feature. To start, carpet tends to hold onto stains and odors. Even if you have diligently cleaned your carpet to stay as fresh as the day it was installed, the expectation among buyers is that carpet will be dingy and stinky, even if it's not. In addition, carpets can hold allergens in a way that hardwood floors do not. Any homebuyers with severe allergies will see wall-to-wall carpeting as a perpetual sneeze machine until the carpet is removed and the floor underneath thoroughly cleaned. There's something to the idea of "curb appeal." You may have the world's most gorgeous home on the inside, but if the yard is weedy, overgrown, bare in patches, or looks like the exterior of Sanford and Son, then your potential buyers will never get out of the car to see it. The popularity of wallpaper seems to ebb and flow, but each time around it comes with a different aesthetic. Wallpaper is coming back in style right now, but the styles are different from what came before. Whether you have the cabbage rose wallpaper of the early 20th century, orange and brown plaid from the 1970s, or the dainty florals and paisleys of the 1990s, it's likely that buyers will want to remove the wallpaper in your home, even if it's just to put up new paper themselves. Remove the paper yourself so buyers won't see your papered walls as a potential cost. If you are a pet-owner or a smoker, you may have lost the ability to smell the scents that your pets or your habits have left behind. But your potential buyers will definitely notice the lingering scent of Rover's accidents, Fifi's litter box, and your ashtray — even if you do not. Invest in a deep-clean of your home before putting it on the market — and then ask a non pet-owning and/or nonsmoking friend to sniff around your house afterward. They can let you know if the cleaning has taken care of the issue, or if you need to replace carpets, draperies, or other items that may have become irrevocably odoriferous. Many homes built between the 1930s and the 1990s have this once-popular type of ceiling finish. Builders and DIY home improvers liked this type of finish because it covered up imperfections in ceiling plaster or drywall. But popcorn ceilings are a major pain in the neck to paint, and they also collect dust in all of their peaks and valleys. In addition, popcorn ceilings that were installed before the late 1980s may contain asbestos, which requires special equipment to remove safely. Even if your home was built after that period, many people assume that a popcorn ceiling has asbestos.